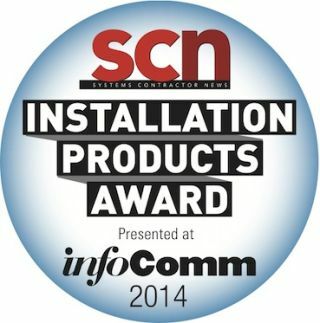 SCN has updated its InfoComm Installation Product Awards program to include a completely new set of categories that better reflect today's business of AV design and integration. The deadline to enter is Monday, February 10. Forgoing the usual minor tweaks to existing categories common to every year's entry and voting process, SCN's panel of consultant and integrator judges wiped the slate clean and came up with an entirely new arrangement of technology categories. A special "Judges' Choice Award" will also be given to one product that will most significantly change AV business. Manufacturer entries for the awards are now being accepted for the 2014 SCN/InfoComm Installation Product Awards. To be eligible for an award, the manufacturer must be exhibiting at InfoComm and the product must have shipped in the calendar year 2013. Winners will be announced on Tuesday, June 17, 2014, during InfoComm 2014 in Las Vegas, NV. Manufacturers must submit their entry for the awards before the deadline of February 10, 2014. Each product entry is $195 and must be submitted via SCN's online entry form at http://avnetwork.com/scnawards. To complete your entry, please send one high-resolution image of each product entered to SCN Associate Editor Lindsey Adler. Every entry in each category will be submitted for judging by SCN's panel of AV integrator and consultants. The judges will select three finalists for each of the 14 categories, and they will determine the Judges' Choice award winner. A ballot listing the finalists will be posted online and published in the April 2014 issue of SCN. Readers will be asked to vote for the best product in each category via an online voting ballot. The winner will be determined by the majority vote in each category.